After our visit to Hiroshima, our Japanese trip was sadly coming to an end. We had to make our way to Osaka for our final two days, before flying home from Kansai Airport. But there was one final place to tick off the bucket list, Himeji Castle. 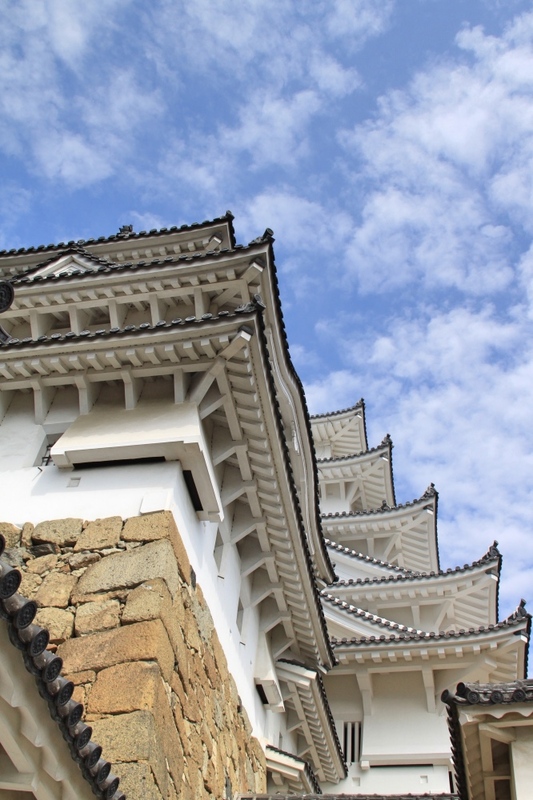 After five years of intensive restoration work, Himeji Castle had finally re-opened its doors to the public. 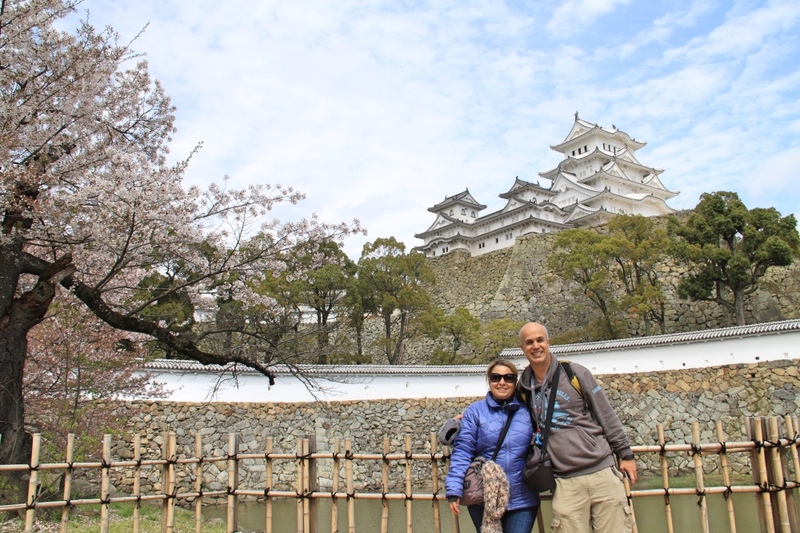 The castle is said to be Japan’s most spectacular, so we didn’t want to miss visiting it. Plus, it was conveniently located on our route to Osaka. 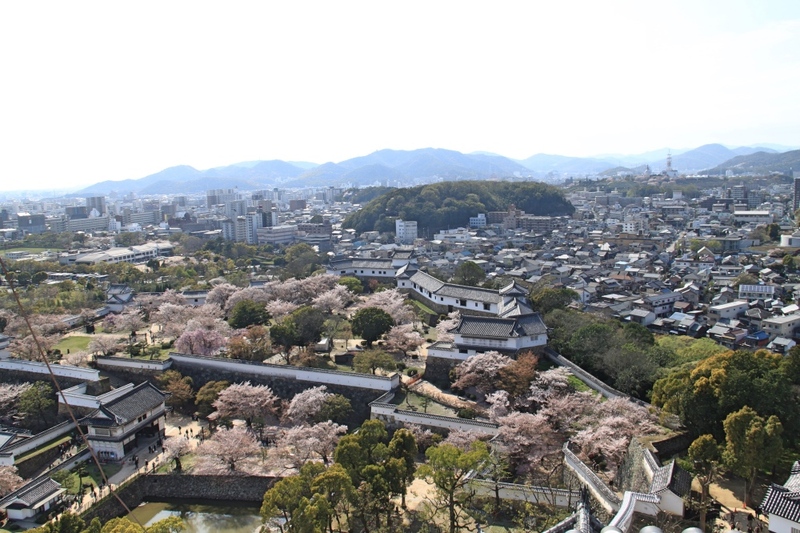 Himeji Castle in all its splendour. 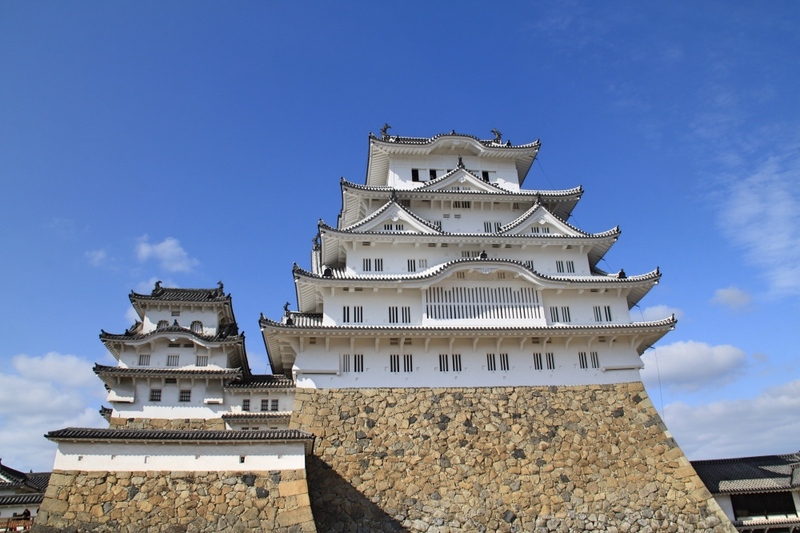 How to get to Himeji castle? 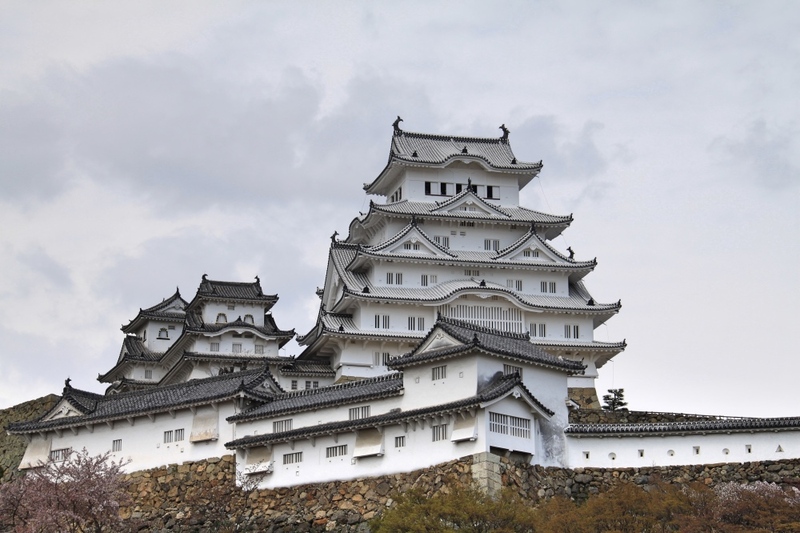 Himeji castle is easily accessible by train from Osaka, Kyoto and Hiroshima. The quickest option is to take a Shinkansen there, and most trains are included on the JR pass. If you don’t have a JR pass, there are cheaper and slower trains to Himeji available from all of those cities. Arriving at Himeji station, the path to the castle was well indicated by signs at each exit. The castle’s elegant white structure was right in front of us as we exited onto the street; you can’t miss it. After a one kilometre walk down Otemae-dori Street, we reached the grounds of the castle. You can also catch a bus from the station, but the walk is pretty easy and takes less than fifteen minutes. Cherry blossoms near the castle’s entrance. 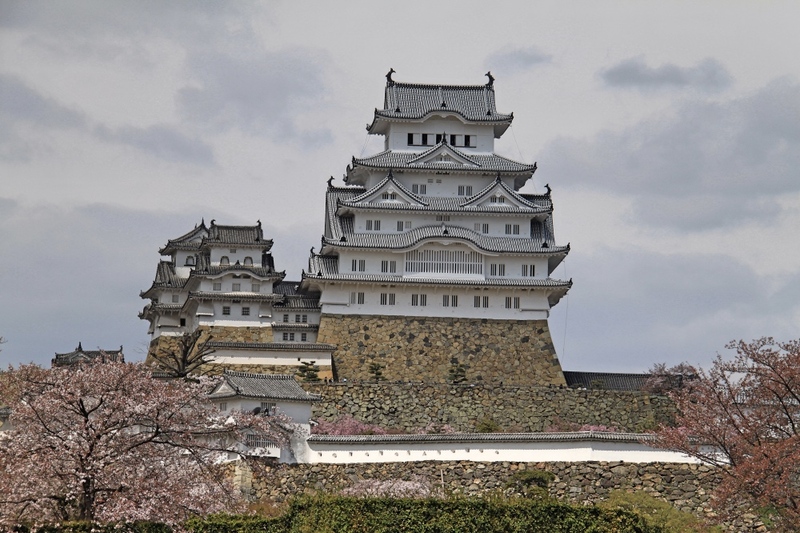 Himeji castle is the most impressive and best preserved Japanese castle still standing. It is one of Japan’s national treasures, and in 1993 was named a UNESCO World Heritage site. While many other Japanese castles were damaged or destroyed by fires, wars or earthquakes, Himoji remained pretty much unscathed. It even survived the 767 tons of bombs that were dropped on the city by the US forces during WWII. The surrounding area burnt to the ground but the castle remained intact. A bomb even dropped onto its roof but failed to explode. That’s super lucky! 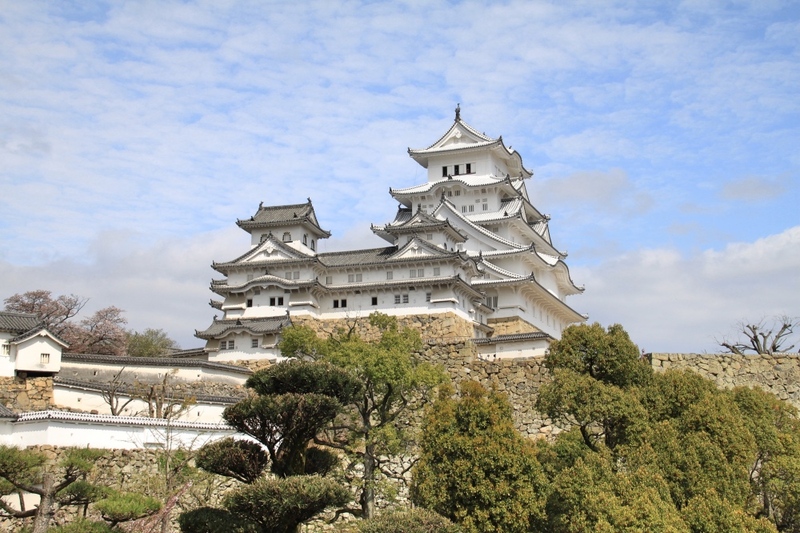 The newly renovated Himeji castle. 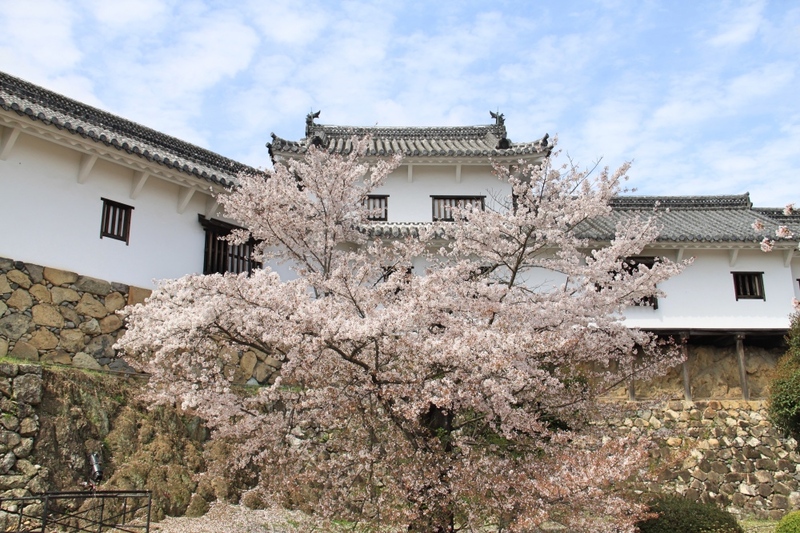 Himeji is also known as the White Heron castle (Shirasagi-jo in Japanese), because of its elegant design and its wooden walls that are completely covered in white plaster. The plaster makes the walls more fire resistant. This is a major advantage, as many other Japanese castles have been lost to fires over the years. 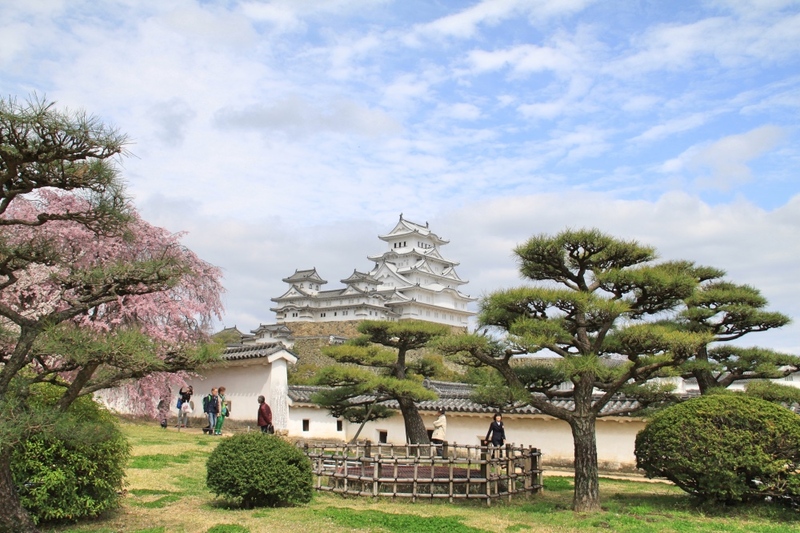 As we entered the castle through the Hishi Gate, we discovered some very good photo opportunities, particularly since we were visiting during the cherry blossom season. The imposing castle is truly a delight to the eye. As we walked the labyrinth-like path from the Hishi Gate to the main keep, we had to stop many times to try and take that perfect shot. The walled path leading to the keep has multiple gates and baileys designed to slow down attacking armies. The main keep of the castle has six stories and you access each floor through a set of steep, narrow stairs. Being quite short, it certainly gave me a good workout, especially since the steps seemed to get steeper as we climbed further up! As you ascend the castle floors become smaller and smaller. Most levels are quite bare and unfurnished. You can see a series of Archer’s portholes and other defence mechanisms employed by the castle. Through those holes, defenders would throw missiles and pour boiling water and oil on top of invaders. Looking up from the bottom of the Main Keep. 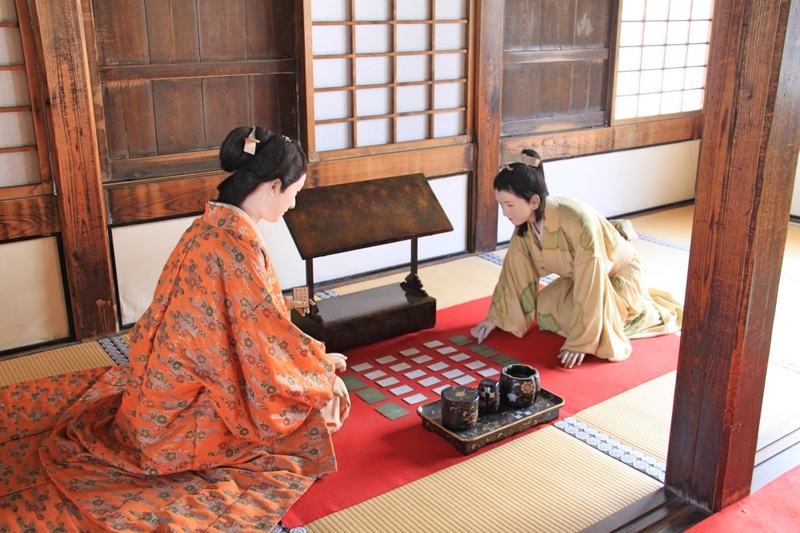 A recreation of the two ladies playing cards inside the Main Keep. 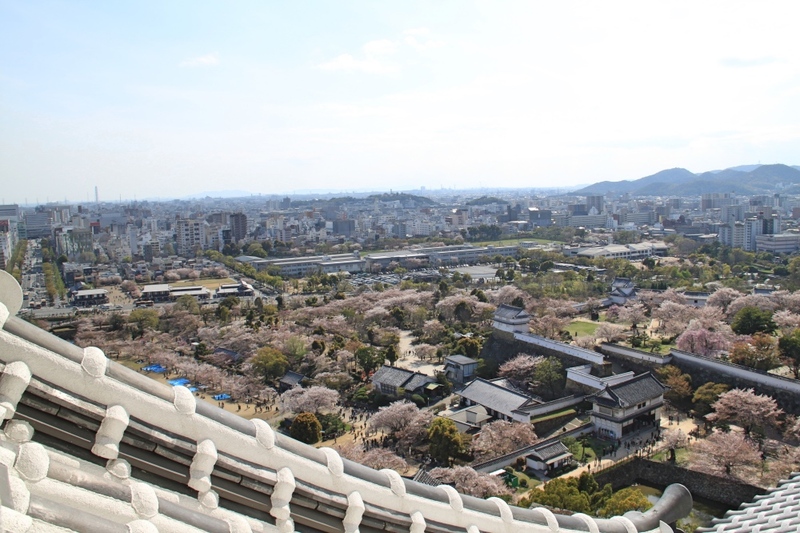 Once we reached the top floor, we were treated to extensive views over the castle roof and out to the gardens, plus a great view of the city of Himeji itself. On the day we visited, the castle was crawling with tourists, but the views at the top made it well worth tackling the steep climb and dealing with the crowds. The extensive views from the sixth floor of the Main Keep. Views over all the cherry blossoms from the top. We left the main keep through the back exit, which led us to some beautiful gardens. It was lovely just walking through these gardens, and we spent a lot of time taking photos of the cherry blossoms. There are two tickets to choose from. One ticket only gives you entrance to the castle, while the other lets you visit the nearby Kokoen garden as well. We recommend the combined ticket as the Kokoen garden is well worth visiting. Tickets cannot be purchased online and are only sold on the day. 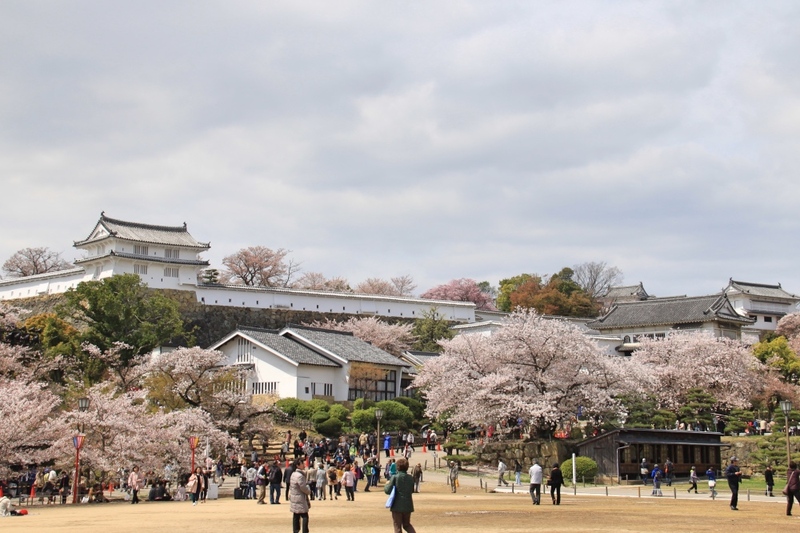 In busy periods such as the summer time, cherry blossom season and the golden week, the number of visitors to the main keep is limited to fifteen thousand. They issue numbered tickets, so be sure to arrive early morning if you visit during those periods, or you might miss out. Walking through the castle’s grounds. 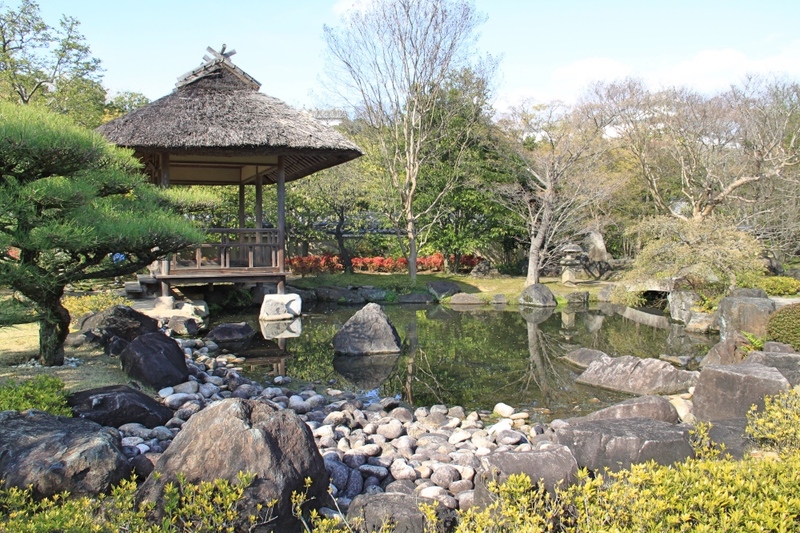 The Kokoen Garden was a great place to escape to after exploring the immensely crowded Himeji castle. 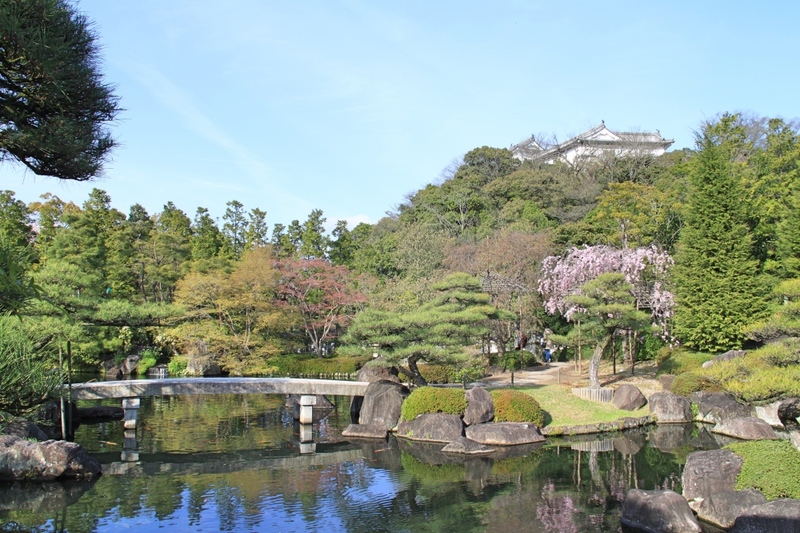 Only a short two-minute walk west of the castle, the Kokoen Garden contains nine Edo-style gardens. They each differ in size, and have a wide variety of plants, with unique landscaping features. Some gardens have flowers, some have bamboo, some have ponds or streams. 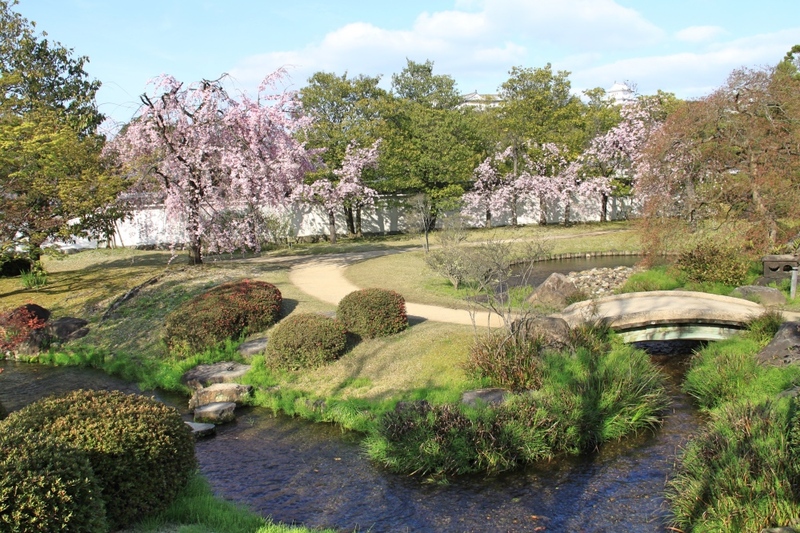 Each of the gardens was very serene and relaxing, after the chaos of Himeji castle. Although visiting Japan during its busiest season, we somehow managed to have these gardens nearly all to ourselves. 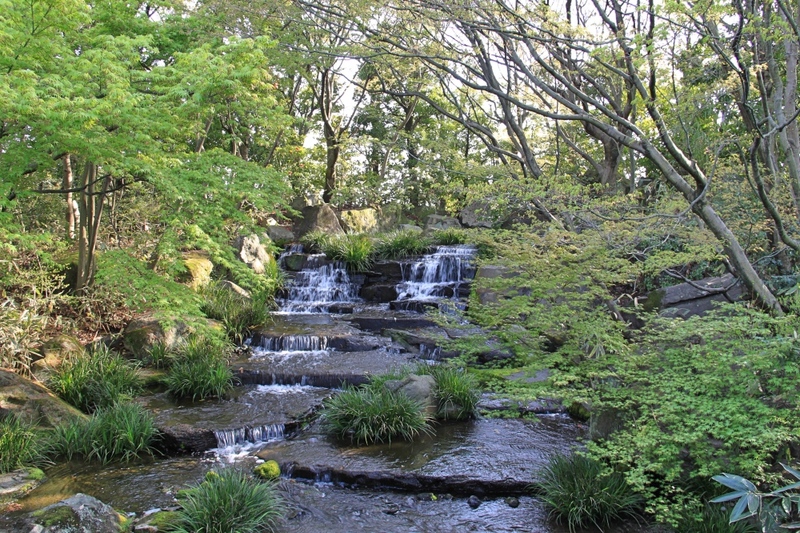 A stream in the Kokoen Garden. If you’d like to experience a traditional tea ceremony, stop off at the tea house. It also offers beautiful views over the garden. More cherry blossoms in the Kokoen Garden. There are lockers available at Himeji station to store any luggage that you don’t want to carry around the city. Small and larger lockers are available from a few different places around the station. We arrived around 10.30am and were lucky to find one, but they seem to go quickly. If you are travelling with large suitcases, you may want to arrive first thing in the morning to make sure you don’t miss out. The Himeji castle website has a congestion forecast to help you avoid the crowds. 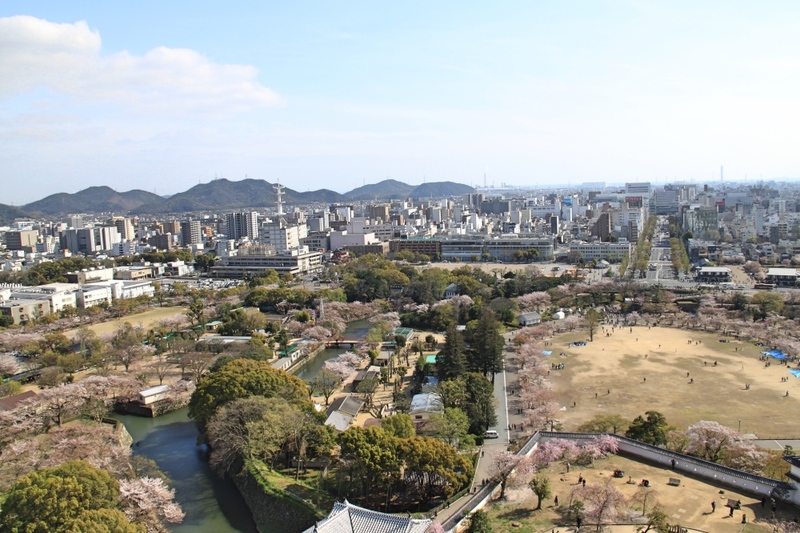 As you can see, Himeji castle is certainly another place to add to your Japanese bucket list. Crowds or no crowds, this place was definitely worth visiting. It really is the “creme de la creme” of the Japanese castles, so if you only visit one castle while in Japan, make sure it’s this one. What an awesome castle! I’m heading to Japan on 19th Sept. I only have a week there. Not sure how I will include this in the itinerary. But seems too good to miss! Thanks Sreekar, I am sure you will love Japan. It’s an awesome country and if you don’t have time to do the castle, I am sure you will be back for more. We can’t wait for a return trip one day. Japan has been on our to-do list since ever and now this castle got just added to it. 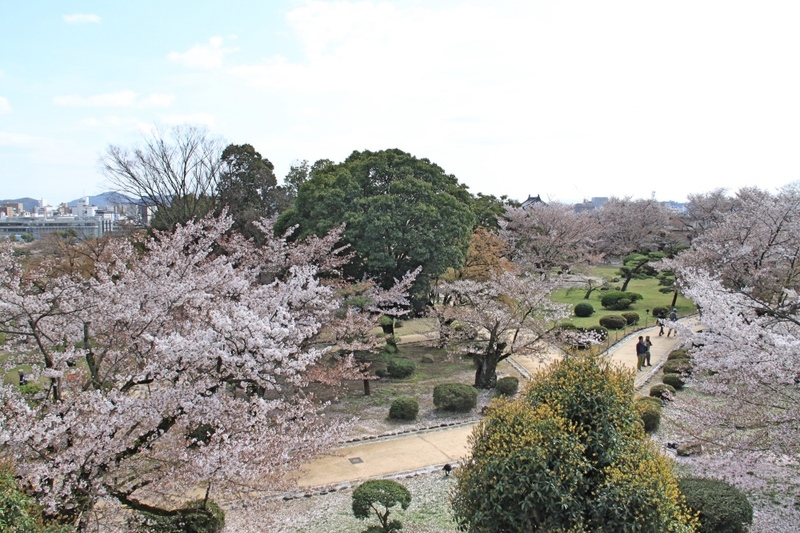 The view on the cherry trees is so dreamy – I am in love. Thanks for your nice comment Amelie. I’ve been to Japan sooooo many times and still haven’t gotten the chance to visitHimeji yet so I’m definitely jealous that you got to go! And better yet you visited at the best time when the cherry blossoms were in bloom!!!!! Your photos are absolutely stunning and just looking at them makes me wanna book a flight back there ASAP! We haven’t been to Japan before, but all the photos I’ve seen just puts it higher on my bucket list. I’ve never heard of Himeji before. Hi Rhonda, I am sure you’ll get to Japan one day and you will love it! Himeji castle is extremely gorgeous. Japan has had its fair share of bombing but to think that the country still has a lot to offer is stunning. The kokoen garden is a site to behold, so beautiful and worth visiting. I’d love to visit one of these days. 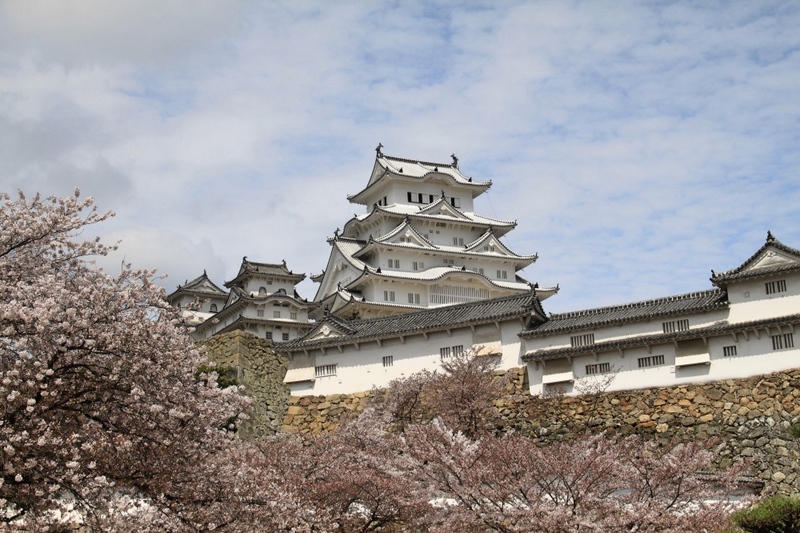 Himeji castle is one of the most beautiful castles in Japan. I visited it during the Cherry blossoms and absolutely loved it. Although it was a bit touristy. I agree, cherry blossom is crazy touristy which is annoying but it’s so pretty with the blossom that it was worth it anyway. The castle looks breathtaking. Straight out of a fairy tale, so picturesque.It is really fascinating how the castle has escaped unscathed the bombings during the world war. One of the most incredible incidents I am sure. No wonder that the castle is a UNESCO World Heritage site. Thanks Sandy, yes this one was certainly a lucky castle! Not the case for many other Japanese castles sadly. 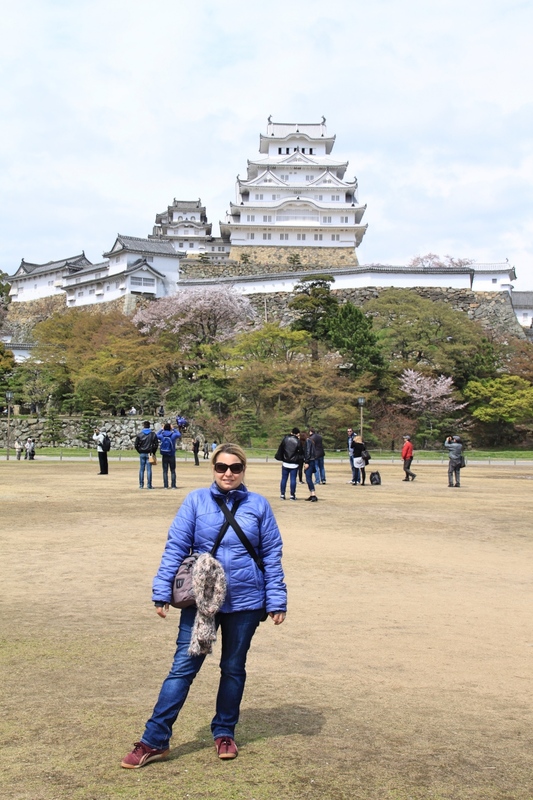 Himeji Castle truly is a splendor! Fabulous to hear that they’ve finally reopened their doors after the renovations. I love that its UNESCO status preserves the authenticity and cultural heritage – how crazy to have seen Archer’s portholes and other defence mechanisms and to imagine the castle being manned back in the day! The views from the top truly are special, and Kokoen Garden too – good to know you can experience a traditional tea ceremony here. Hope I have the chance to travel soon! Thanks for your comment Megan, I agree the UNESCO status is the best thing. Preserving our cultural heritage is important so our future generations get to enjoy them too. I’ve always associated castles with fairy tales, but Himeji castle looks like it was made for them. Maybe it’s the white cherry blossom surrounding it, and the white-on-white exterior, but the whole set up is like a living fantasy! There is an element of the unreal in it’s history – hard to believe it survived so many bombs, including the unexploded one on the roof, but it’s great that it now has UNESCO protection. I hope that means it’ll be there for many years to come – or at least until I’ve had a chance to see it! Hi Marion, yes it’s pretty amazing that it’s still standing considering. I am sure you will get to see it one day.